Dwell magazine has a great article about San Franciscans’ digging up their sidewalks and planting gardens. Much of the credit is due to Jane Martin and her organization Plant*SF, which has helped neighbors and corporations turn concrete into habitat for plants, wildlife and community. Compared to San Francisco, Tokyo’s climate, with almost year-round rain, offers an even greater potential for plant life in public spaces with minimal care. With so many avid gardeners growing such a variety of plants in small pots, I can only imagine how much more impact they would have if they received government or nonprofit help to dig up the concrete and plant directly in the earth. One of my neighbors cultivates her entrance and the side of the street along her building. Recently she showed me that she is growing rice in three small plastic buckets. I am impressed with this small bit of urban farming, so evocative of Japan’s agriculture and scaled for the city. Her small garden spans public and private space, and is constantly changing by season; last month was hydrangea and peony, now rice and roses. She is constantly present on the street taking care of her plants and chatting with passer-bys. Her presence is reminiscent of the urban life created by Baltimore “stoops,” marble block steps, yet without the steps. Last week I heard Peter Head of ARUP present “Entering the Ecological Age,” the Brunel Lecture for the Institute of Civil Engineers. Director of ARUP’s “integrated urbanism” practice, Head focuses attention on the potential devastation of climate change and the role of cities in launching a new ecological era that uses renewable energy efficiently. Head’s most sobering prediction is that by 2100 there is a 50% chance of earth temperature rising by more than 5 degrees celsius, which would lead to the end of human civilization. The solution is massive reduction in carbon dioxide by retrofitting old cities and building new ones organized around non-polluting transportation. Surpassed only by Australia, the US uses twice the energy per capita of Japan and Europe because of its reliance on the automobile as the primary transportation vehicle and the great distances between housing, work, schools and shopping. I was interested in Head’s advocacy for “biomimicry.” Janine Benyus’ 1997 book Biomimicry: Innovations Inspired by Nature lists ten principles include uses water as a resource, diversfty and cooperate, gather and use energy efficiently, optimise not maximise, use materials sparingly, clean up not pollute, do not draw down resources, remain in balance with the biosphere, run on information, and use local resources. I also found it interesting that Head believes cities are the most dynamic and capable of meeting the challenges of the post-industrial age. He cites the work of C40 Cities as climate leaders. Some urban initiatives he cites are Seoul’s removal of a freeway above the Cheonggyecheon River, and Singapore’s introduction of dragonfly habitats to reduce mosquitoes and dengue fever. Head advocates an 80% carbon reduction by 2050 (compared with 1990 levels), which will require massive change in advanced and developing countries. His work seeks to contribute to the 2009 COP 15 meeting in Copenhagen (Convention on Climate Change), the most important since the 1997 Kyoto Protocol. You can download a lengthly PDF version of the talk on the ARUP website, and watch video of the lecture on a website called Resilient Futures. Japanese corporations are funding innovations in urban ecology. Suntory, one of Japan’s largest beverage companies, has a subsidiary called Suntory Midorie that creates green roofs and green walls. Examples of their work are on display in Shibuya and used on Suntory’s Tokyo headquarters. Gaia Initiative is a non-profit that brings together corporate leaders and academics to promote environmentalism. They are currently sponsoring anthropologist Takemura Shinichi’s Tangible Earth, a giant globe that provides live data about global warming, climate change, and disaster prevention. The adviser list includes CEOs of leading companies such as Benese, Pasona, Mitsui Fudosan, Doutor Coffee, and Asahi Breweries. 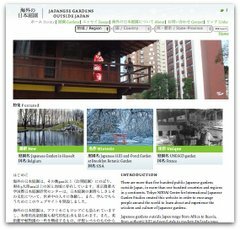 A great source for news in English on Japan’s corporate eco initiatives is CScout Japan, a trend research company. Check out their blog’s “eco” tag. I wonder if there is this much corporate activism in Europe and the United States. And in Japan, I wonder how corporations can best work with ordinary gardeners to transform cities into urban forests. 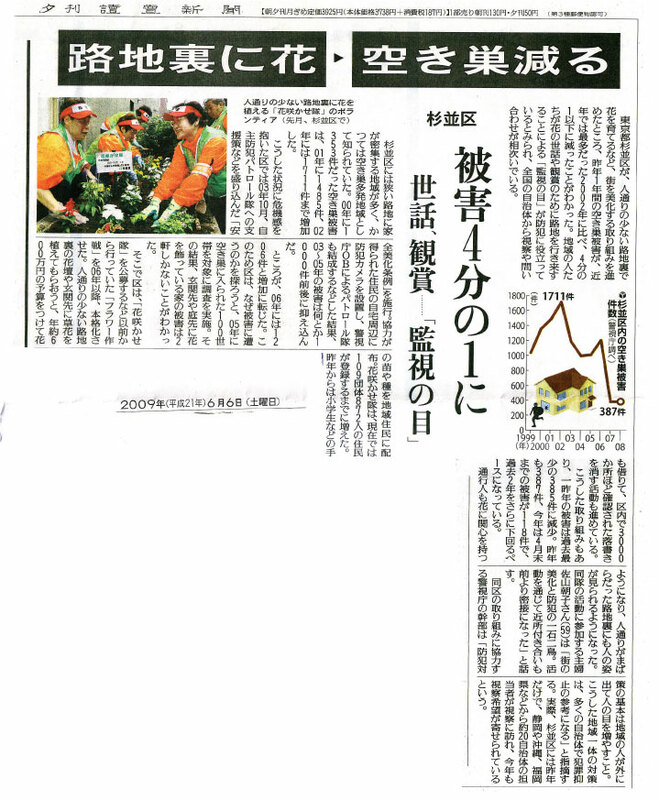 A friend in San Francisco sent me this Reuters news story about a municipal government program in Suginami ward to plant flowers facing the street as a crime prevention measure. The article cites a city official saying, “The best way to prevent crime is to have more people on the lookout.” According to city officials, encouraging street flowers has lowered burglaries by 80% from 2002 to 2008. Read the full article. Update: Suzuki-sensei at Nodai kindly provided me with the Yomiuri news story from June 6, 2009 which provides more detail. Apparently, before turning to flowers, the Suginami ward government tried security cameras, which worked but only for a short period. The local government than did a survey that found that only 2 of the 100 homes that experienced robbery had plants outside. Suginami achieved this remarkable crime reduction by spending 6,000,000 yen (about $65,000) per year on plants, and organizing 109 “Flower Blooming Troops” (花咲かせ隊) groups with 872 residents participating. The effectiveness is attributed to the plants bringing more people into small alleys and to neighbors interacting more with eachother. Governments from Shizuoka, Okinawa, Fukuoka and seventeen other Japanese prefectures have visited Suginami to study this crime success. It is also interesting that this news story spread to the China Daily, Brunei Times, Australia’s ABC, Times of India, and the Iran Daily.